You heard me right, still going on getting your FREE TEE at their Warrior Poet Armory, which has 6 style shirts to be given away. I featured the Warrior Poet Spring Cleaning Giveaway at my Angels in my Life blog – 2 days before the Giveaway starts. As one of the ambassadors, this email was sent to me a few days earlier before the giveaway date starts. I’m pleased; during the same day, I acquire my own free tees for my son or least I would not obtain my son’s right size. Today, I’m showing you proof of the receipt after I got my own FREE TEEs from Warrior Poet Clothes. 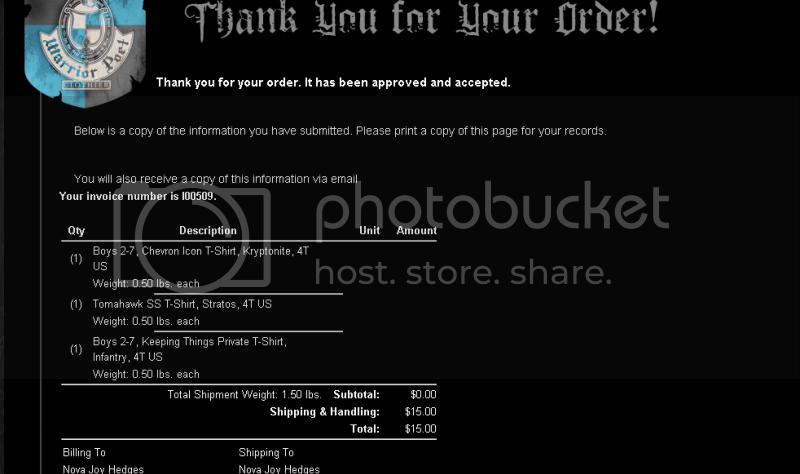 I acquired 3 free shirts, and only pay the shipping & handling that is only $5.00/T-shirt. You still your chance, while supply last, get yours now. Sounds like a great deal - how does the sizing run? Did you feel it was accurate? I got mine yesterday, it looks nice. I only paid $10 for two shirt. Can't wait for my kids to try it.